I must destroy Shrek! And then /I/ will be the most beautiful guy in Shrekworld! Silence! I will make this Princess Fiona my queen, and Duloc will finally have the perfect King! Captain, assemble your finest men, we're going to have a tournament! Very well ogre, the deed to your swamp. Cleared out as agreed. Take it and go, before I change my mind. Forgive me, Princess, for startling you. But you startled me for I have never seen such a radiant beauty before. 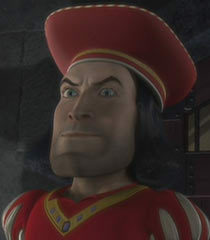 I am Lord Farquaad. All this hocus pocus alters nothing. This marriage is binding and that makes me king! (indicating his crowned head) See! See!